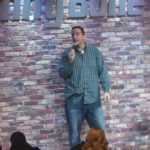 This past weekend I was performing at the Albany Funny Bone. It was poor timing because I had to leave home after only seeing the 1st two parts of the six part series Surviving R Kelly. I asked the crowds not to spoil the last four parts for me, but my suspicions were confirmed Monday afternoon when I watched them – R Kelly is a terrible person. But this is not about the Pied Piper of R&B – this is about the (what is the opposite of Pied Piper – Repellant, Career Suicide Maker?) Career Incinerator of Comedy. So let’s Laugh in the Name of Hate with this recap – in which I survived 3+ days on one pair of socks, sold a lot of albums and took a request from a fan to disastrous results. I brought 43 albums with me (20 Thots & Prayers, 23 Trump albums – Fireside Craps) on the Amtrak north to Albany. I also packed clothes and a book I was finishing on humanity’s effect on Earth (2014’s The Sixth Extinction – basically we are a plague upon the Earth and that was before the modern GOP created a bottle neck in international politics related to climate change). What I did not pack were any pairs of socks. I would realize this on Saturday. I got to the new hotel that the club uses. 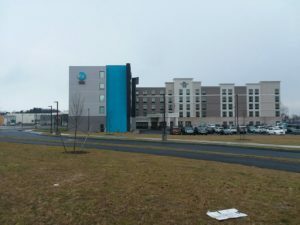 The used to use the Hampton Inn about a mile down the road from the shopping mall where the club is housed, but Hilton built a new hotel on the mall premises and that is where I got to stay. The Hampton Inn on Western Road I still highly recommend – the staff was superb there, but nothing beats being able to walk to the club in 5 minutes when you are a carless comedian getting coffee. The weird thing about the hotel is that it is two Hilton properties in one building. On the left is Tru (where I stayed) and on the right side it was a Homewood Suites. It sort of reminded me of that movie I did not see, but saw several previews for, Trouble at the El Ray. The crowds Friday were awesome (and right now there are at least 300 people in Albany trying to take credit for my usage of Tater Thots to describe chubby, tattooed white women of America). A buddy from college showed up with some family members (I gave them a free Trump CD) and I managed to sell a couple of albums. But it seemed like a lot of recent trips I had overpacked the merch. The headliner was selling t-shirts, which audiences love, the way social media loves memes. But I did receive several handshakes and compliments, BUT I CAN’T FEED MY DOG WITH THOSE! Also a guy came up to me with his wife after the second show and said “That Air Bud-Weinstein joke is the funniest bit I’ve ever heard. And I come here a lot.” And then he walked away. I CAN’T PAY BILLS WITH THAT (and it happens to be on Thots & Prayers)! I went back to the hotel after, reviewed the tapes of both shows confirming my status as a comedy genius and then fell asleep. Unfortunately I discovered Saturday afternoon that the critical 2nd step was disturbed. I made a mental note to buy socks at the mall and change before the show. I did not remember until around 10pm when all stores were closed. But, fueled by a dinner at Pizzeria Uno, I crushed both shows. I even had 4 Albany fans/quasi employers show up (readers of this blog should remember that for a couple of summers I did a show at a mansion in Albany for a man named Dave – he threw very cool end of Summer parties for his friends). They remain the only private shows I have ever done that were fun. I ended up selling a lot of albums after the two shows, but the second show is the real story here. In addition to actual fans showing up to the first show, a woman came up to me before the 2nd show (she was there for the 2nd show) and said “I saw you last time you were here and that Spirit-Southwest joke you did I have been telling to my sister for like a year. Will you do it?” I told her that I hadn’t planned on it (the industry may be stupid enough to keep me down on the depth chart, but I keep a headliner’s production pace in case they ever wake the F up), but I would do it for her. SHE THEN CALLED OVER HER SISTER AND A FRIEND/BOYFRIEND/CUCK TO WATCH ME DO IT AT THE MERCH TABLE. I then explained that I would do it on stage during the show. The bit is about 6 minutes so it ate up a good, unplanned chunk of my 25 minute set but it killed. The rest of the set went well. As I mentioned I sold well after, but guess who I didn’t sell to? The “Dance monkey dance!” woman! She walked by, gave me a finger gun and said “thanks for the joke!” Fortunately I was in too good a mood to dwell (I attribute it to my recent purchase of The Greatest Showman soundtrack which is offensively catchy – I was surprised by how much I liked the movie and the album was only $6.99 on iTunes, and studies show that musical taste is not binary) but I would have been less offended if she had pegged me at Tru by Hilton and left without leaving a tip. I woke up at 530am, most likely because I had a cup of coffee in between the two Saturday night shows. Coffee seems to incubate in me and kick into gear 8-11 hours later. Well, knowing there was an 8am Mass 2 miles down the road I got dressed and power walked my way to Christ The King. As I have noted in previous road posts, I always like going to Mass outside of NYC because 1) they are more full and 2) people shake hands and aren’t a bunch of Purell losers who wave at you, even if they are sitting next to you (as I said on Israeli Tortoise – “Jesus could wash the feet of lepers but you can’t shake my fu*king hand? Real fu*king Christ-like!” And speaking of Christ after Mass and breakfast I saw buff Jesus/Homeless Fabio Jason Momoa in Aquaman. It was surprisingly adequate. And I think it was the best Post-Nolan (also my rap name) DC film for sure (spare me your Wonder Woman nonsense). After the movie I remembered to buy socks… and decided not to. I figured I would be home in less than a day where I have many pairs of clean socks so I could make it one more day. Sunday’s show was my favorite show of the week. It was a packed house and most importantly they bought more albums than any single show that weekend. I arrived with 43, sold 40 and gave 1 away. #GOATFeature (though it helped that the headliner had run out of t-shirts mid Saturday) Additionally, I had crushed an R Kelly bit on Sunday and wanted to post it to YouTube. However when I reviewed the tape, a black woman located near my camera was ordering her “well done, but not burnt!” steak too loudly and it is really distracting from the bit. Obviously R Kelly still has some allies among black women. SMH in the name of love.